The Russian Navy doesn’t intend to use its two newest Borey-class nuclear-powered ballistic missile submarines (SSBNs) without their Bulava missiles in a multipurpose role. Not even temporarily. At least according to one source. On 1 November, a Navy Main Staff source told ITAR-TASS that operating the new SSBNs without 16 Bulava (SS-NX-30) submarine-launched ballistic missiles would be analogous to employing Tu-160 strategic bombers like fighter aircraft. Earlier, however, RIA Novosti reported the Navy might accept the two Borey SSBNs for “experimental” use without Bulava missiles, citing a highly-placed General Staff source. A submarine in such a status would not technically be in the order-of-battle. Russia’s first Lada-class (proyekt 677) diesel submarine Sankt-Peterburg currently operates “experimentally” in the Northern Fleet. The General Staff source said, without their primary armament, Borey hull 2 Aleksandr Nevskiy and hull 3 Vladimir Monomakh could serve temporarily as multipurpose submarines. Their crews could fulfill non-strategic combat training missions until problems with Bulava are resolved. Both new SSBNs were ready for fleet acceptance before the end of 2013. Vladimir Monomakh just completed sea trials in early October. 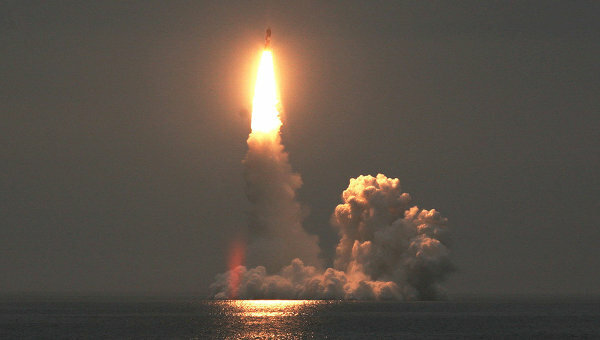 On 6 September, Defense Minister Shoygu stopped the acceptance process for both submarines after an unsuccessful Bulava test launch from Aleksandr Nevskiy. Before that failure, the missile had five consecutive successful launches in 2010-2011. The Navy accepted the first Borey-class submarine, Yuriy Dolgorukiy, in early 2013. RIA Novosti has its list of the main military events of 2012. No surprise number 1 is the Oboronservis scandal, the fall of former Defense Minister Serdyukov, and appointment of successor Sergey Shoygu. 16 accidents in munition destruction leaving 12 dead and 23 injured. Retirement of the CO of the Strizhi flight demonstration group who allegedly demanded money from subordinates for the freedom to show up for duty or not. Remember Senior Lieutenant Sulim at Lipetsk? Vityazi flight group doesn’t participate in Farnborough. Ex-Gorshkov carrier still not delivered to India due to power plant problems. Rearmament of RVSN with Yars and Topol-M ICBMs. See Karakayev’s remarks the other day. Acceptance of Dolgorukiy, Nevskiy, Bulava, and Severodvinsk all put off until 2013. Delayed space vehicle launches, but fewer failures than in 2011. The death of Ruslan Ayderkhanov. A surprise pick. Remember the army and medical examiners say he killed himself even though he was beaten and abused before he died. The contract for five Borey SSBNs, and Prime Minister / President Putin’s role in getting the Defense Ministry and industry to agree on a price. The collapse of Moscow’s $4.2 billion arms deal with Iraq amid talk of corruption. Losing another Indian helicopter tender to the U.S.